A blood clot buried deep in a vein can break apart, travel to the lungs, and become a life-threatening pulmonary embolism. Although caused by the same thing—blood that has clotted—the symptoms of DVT and PE are very different. Harry matched up with the profile of a person at risk for deep vein thrombosis (DVT) and its potentially deadly complication, a pulmonary embolism (PE). Well into his 70s, he’s a bit overweight, a diabetic, has had both knees replaced, and survived a heart attack. He leads a very active life, including frequent travel. Flying doesn’t bother him nor does driving long distances—often with few stops along the way. In June 2017, he flew from Houston to Barcelona, rented a car, and began what would have been a two-month driving trip around Europe to enjoy its sights and visit friends. Halfway through the trip, he began to experience weakness and shortness of breath. By the time he got to an emergency room, the symptoms had worsened. He was quickly diagnosed with a pulmonary embolism, treated with blood thinners, and spent the next 18 days in an intensive care unit at a hospital in Bosnia. Harry could have died, but two things saved his life: good medical care and good luck. Twenty-five percent of pulmonary embolism cases cause sudden death, and PE will ultimately be fatal in up to 33 percent of cases. When he was released from the hospital, Harry was instructed not to get on an airplane for two more weeks. He drove back to Barcelona, returned to the States, and is leading a relatively normal life, still traveling when he wants to. 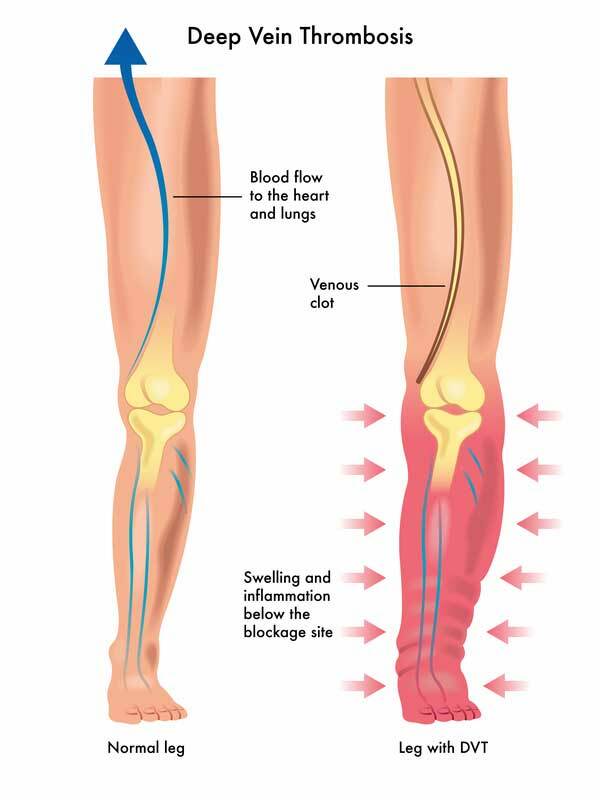 Deep vein thrombosis, according to the Vascular Disease Foundation, happens when a blood clot (thrombus) forms in the large veins, usually in muscles of the legs or pelvis. If untreated, a piece of the clot (embolus) can break off, move through the body to the lungs, and block the flow of oxygen-carrying blood to the lungs and heart. Although caused by the same thing—blood that has clotted—the symptoms of DVT and PE are very different, as shown below. Not every patient has every symptom. In the case of DVT, symptoms can develop suddenly, over a period of time, or in 50 percent of cases, not at all. In PE, symptoms are recognizable but also similar to those experienced in patients with pneumonia, heart attack, and other conditions. For both conditions, the list of risk factors is long. It includes aging (but it’s possible at any age), sitting for long periods of time, prolonged bed rest, pregnancy, use of birth control pills or hormone therapy, being overweight, heart failure, inheriting a blood clotting disorder, smoking, varicose veins, hypertension, and having been treated for cancer. Anything that affects the normal flow of blood—damage to the veins, a broken hip or leg, or having major surgery on the hip, knee, or lower leg—makes a person more likely to develop DVT. Ultrasound uses sound waves that bounce off the body to create an image of the blood vessels. Duplex ultrasound adds Doppler technology to ultrasound and produces a color image of blood moving through the circulatory system. In some cases, three-dimensional magnetic resonance imaging (MRI) is used to determine the exact location of a blood clot. Blood tests can detect substances that lead to clotting. The primary treatment for DVT and PE is blood thinning drugs that keep a clot from getting bigger, prevent it from breaking up, and reduce the risk of another thrombosis. The drugs include heparin (Hemachron, Hep-Lock), which is administered intravenously or by injection, Warfarin (Coumadin), which is taken orally and may be prescribed for 3-6 months after taking warfarin, and factor Xa inhibitors (Eliquis, Arixtra) a newer anticoagulant. 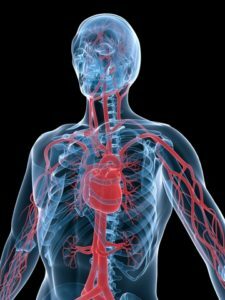 If these drugs are not effective in stopping the clotting, surgery may be necessary to insert a device into the vein leading to the heart so that it filters blood and captures clots before they cause life-threatening damage. First on the list is to move. Whether traveling, sitting at a computer, or watching TV, stand up every 20-30 minutes and move around whatever space is available. If you can’t get up, flex and extend your lower leg and feet/ankles regularly. Make exercise a daily part of your routine, not something to do when it’s convenient. You’ve heard the next two prevention strategies for a variety of conditions, but they are especially important in regard to deep vein thrombosis. Stop smoking and lose weight. Up to 600,000 people in the U.S. get a blood clot in the legs or lungs each year. Deep vein thrombosis is serious and requires medical intervention. A pulmonary embolus is more than serious. It’s deadly and requires immediate attention. Takes steps now—literally—to lower your risk of both. a heart attack, aging, benefits of stretching, birth control, blood clot, blood pressure, blood thinners, broken hip, cancer, chest pain, deep vein thrombosis, dementia, diabetes, diabetic, embolism, exercise, heart attack, heart disease, heart failure, hormone, hypertension, hypertension guidelines, long periods, Lose Weight, new hypertension guidelines, pain, pain behind knee, pneumonia, risk of heart disease, shortness of breath, skin, smoking, thrombosis, varicose veins, vascular disease. Very interesting, useable information. Glad prevention information was stressed which made the article more valuable for health education class. I have blood clots in both legs and i am on blood thinners but now they are behind me knee and now my legs are numb and i am not scared but i want to know what my doctor will do next or should i do next?